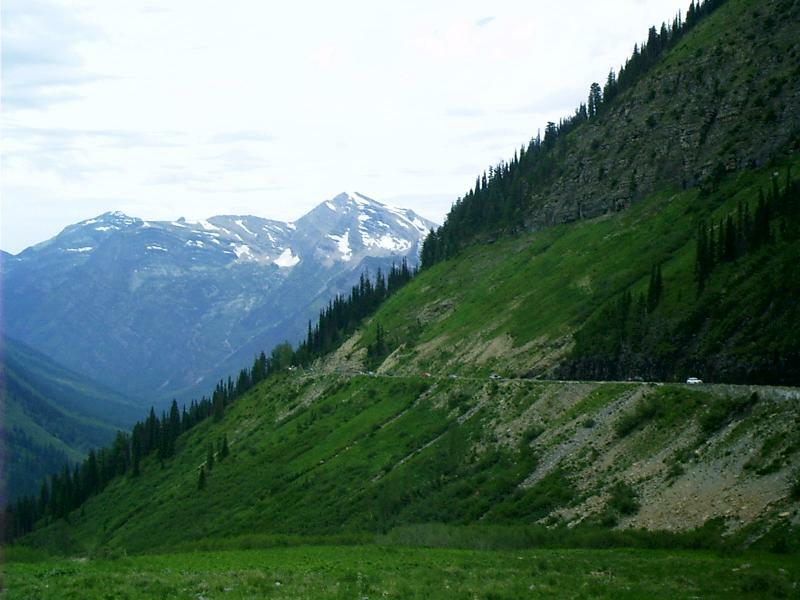 Going to the Sun Road (GttSR) is 52 miles long between its junction with US 89 in St Mary, MT, (elev. 4,560 ft) and its junction with US 2 in West Glacier, MT, (elev. 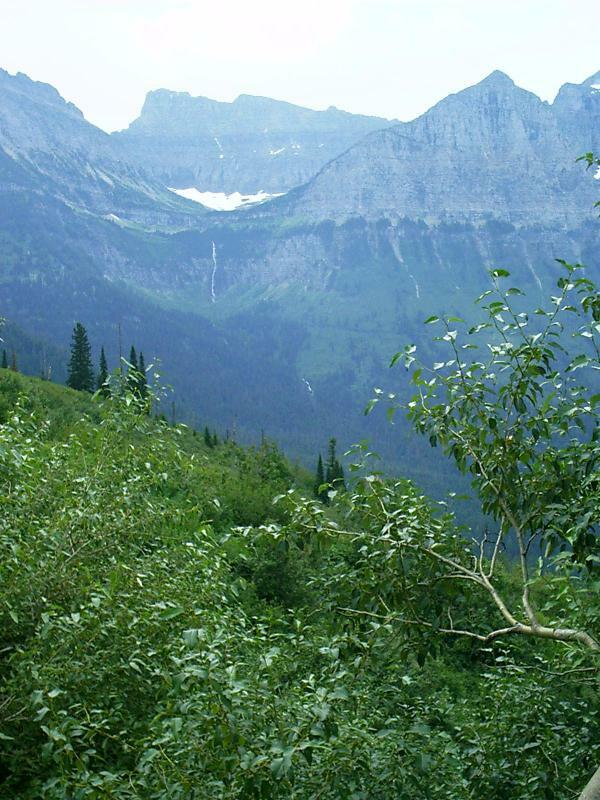 3,154 ft) near Apgar, MT. 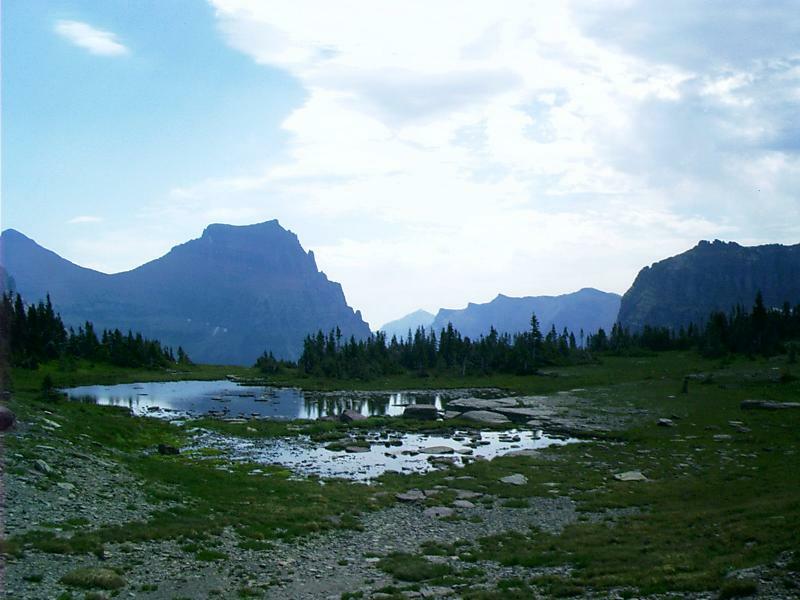 Visitors' centers are located in those places and at Logan Pass (elev. 6,646 ft). The "Big Drift," a wall of snow and ice heaped by winds onto the eastern flanks of Logan Pass, tops out at about 80 feet, burying the Going-to-the-Sun Road for most of the year. The earliest date snowplows were able to push the winter's weight off the alpine section of the road was May 16, 1987. The latest date was June 23, both in 1991 and 1995. Snows generally reclaim the highway by Halloween. 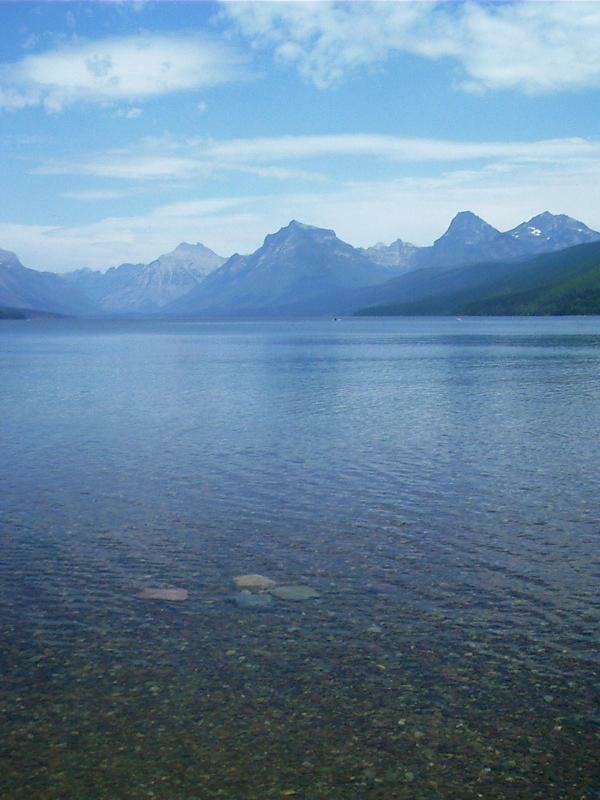 In 1911, only 4,000 visitors came through Glacier National Park's gates. A decade later, in 1920, visitation had grown to 22,500. Most of those people arrived by train, and then traveled Glacier's backcountry in a saddle. At their peak, the park's stables housed 1,000 horses and served 10,000 tourists per year. By the 1930s, horses had given way to cars, and the explosion of tourists exploring America by automobile resulted in a similar explosion in national park visits. 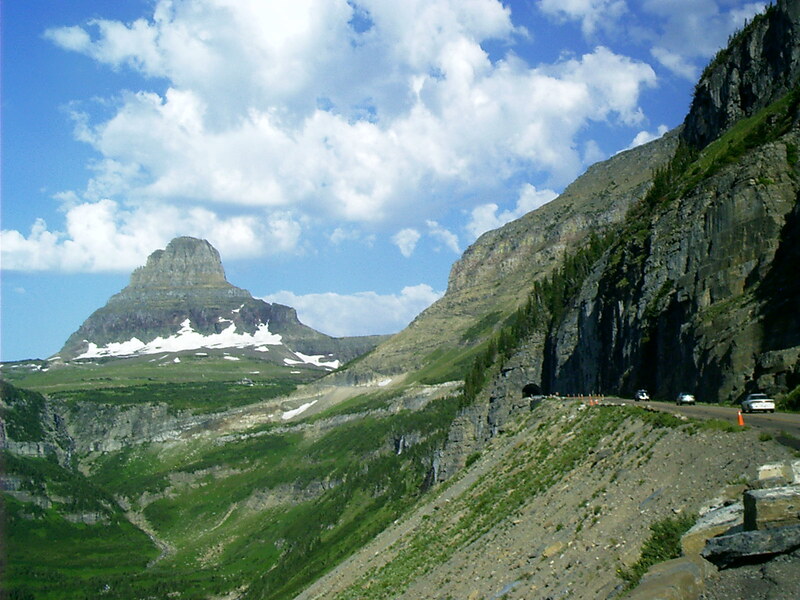 In 1933, the year before the Going-to-the-Sun Road officially opened, about 76,000 people visited Glacier. Just one year later, with the road advertised as ready for motorists, 116,965 visitors drove 40,000 cars to the park. Today, nearly 2 million people drive 500,000 cars over the Sun Road every year. 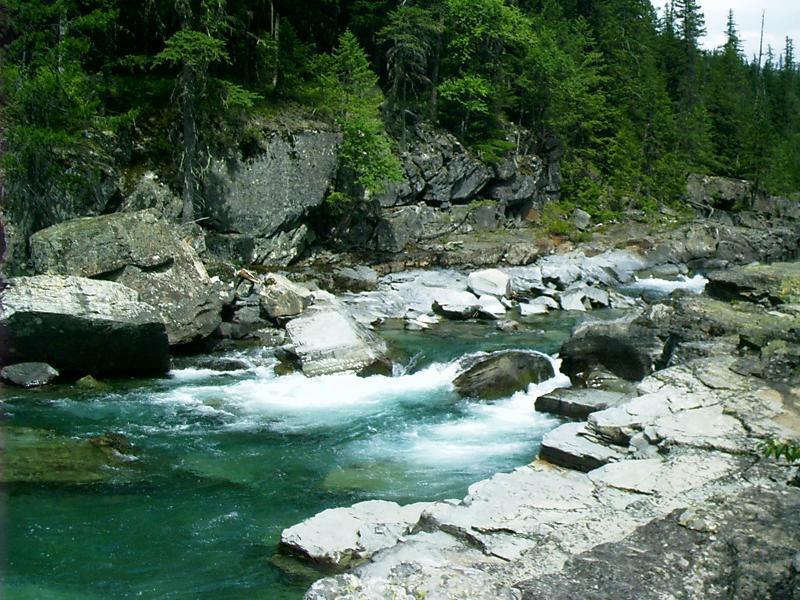 Not a few questioned the motives of those pushing for a transmountain route through Glacier, and some went so far as to construct elaborate conspiracy theories. A 1921 editorial in the Cutbank Pioneer Press, titled "That Fairy Highway Through Glacier National Park," concluded the entire enterprise was but a ruse to pad the pocketbook of [Great Northern] railroad tycoon Louis Hill. In the editorial, Glacier County Commissioner J.M. Hyde announced what he held to be a plot in which Hill secretly bankrolled an impossible road that, if finished, would remain closed "ten or eleven months of the year." That way, Hyde said, Hill's railroad could continue to cash in by hauling about 8,000 cars across the divide every year, at a price of $10 to $15 per car. The debate raged until construction began on Highway 2, a year-round road wrapping over the low, wooded brow beneath the park. "People wanted a practical road," Carr said. "Well, the Sun Road was never going to be a practical road. It was designed from the beginning to be a spectacular road." The spectacular road finally would not have its 15 switchbacks, leaving motorists above to look down upon lines of motorists below. 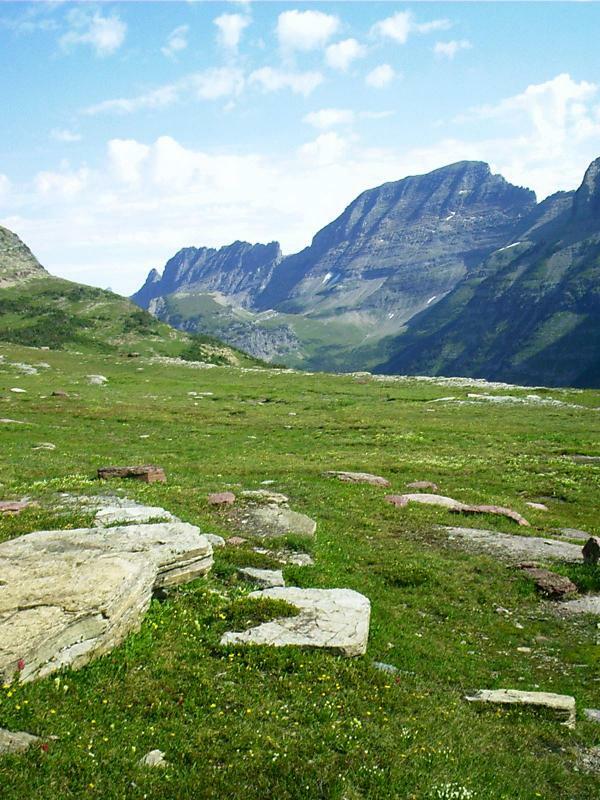 Instead, it would have one great switchback, and then would traverse the sheer cliffs of the Garden Wall on its approach to 6,646-foot Logan Pass from the west. Motorists would look down on unbroken forest and silvery flashes of river, not on the roadway below. The Park Service laid down strict rules regarding light-on-the-land construction, insisting on small blasts, a minimum of power tools and a very narrow corridor of environmental impact. The Bureau of Public Roads complied when convenient, and ignored the rules the rest of the time. "Our friends at the Bureau are essentially road builders, dirt movers, rock blasters, (and) surfacing experts," wrote park Superintendent Charles Kraebel in a 1926 letter. "They are only beginning to learn what the park roads require in the way of landscape protection. ... We are not safe in giving them too free a hand." One crew, working with far too free a hand for Kraebel's liking, cut a narrow walking ledge along the vertical wall. They then spent an entire week edging their way along that lip, packing drill holes with more than 12 tons of black powder and 80 crates of dynamite. The men wore wool socks over their hobnailed boots to avoid throwing sparks while they worked. And when they blew the charges, an entire mountainside rumbled into the valley below. Trees were mowed over, carried down by the force of the blast and the rockslide. Those huge trunks filled the rivers, where they piled up in logjams and caused the waters to flood out the recently completed lower road. Jean Ewen, writing in the September 1934 edition of "Civil Engineering," notes that, "The greatest achievement in the construction of the Going-to-the-Sun Highway is not its character as an engineering feat. This must be considered only secondary to its greater function, that of making accessible to modern transportation the age-old wonders of the engineering of time and the elements -- the movement and construction of a range of mountains, the excavation of great channels by glaciers whose probable dimensions must tax even the most vivid imagination. Our only prayer must be that our work may be truly a component part of this wonder of nature, that we may not have marred that which we, with all our science, knowledge and experience, could never reproduce." Don't miss riding GttSR; just be aware that it is heavily traveled. Vehicles wider or longer than 8x21 ft are prohibited. Drivers must be cognizant of overhead clearance of tall vehicles. There are time-of-day regulations about which lanes may be used by bicycles. Consider taking a bus tour. If you drive, go early. That way you will be able to find parking spots on the more popular turnouts. Be alert to other traffic of the four-wheel and the two-wheel kind. Also, watch for hikers of the two-foot and the four-hooved kind, crossing where sightlines are shortest. 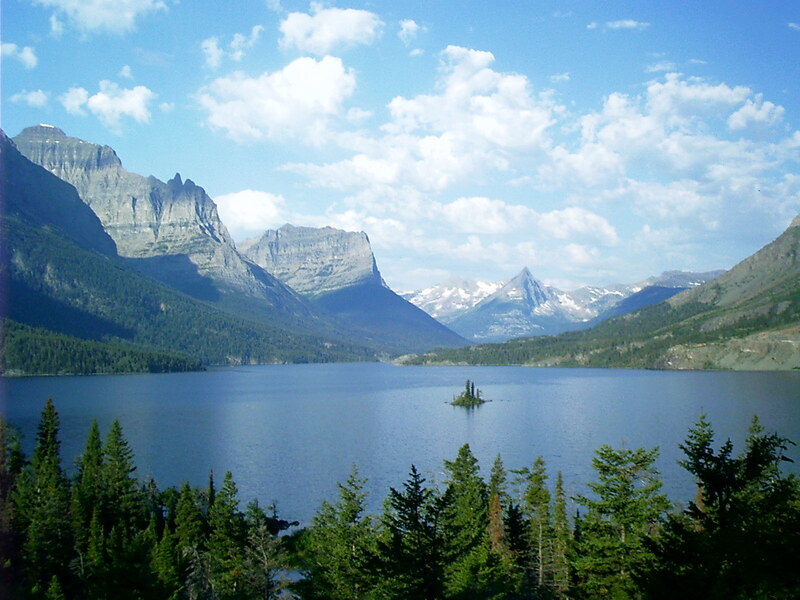 A fee is charged for admission to Glacier National Park via GttSR. The pass you receive is good for a week thereafter at any entrance. Take the opportunity to ask the Park Service about road delays due to weather and construction. GttSR continually undergoes renovation. When I crossed it on 02 AUG 2004, I was held up in traffic for a few minutes in a couple of places by road crews repairing retaining walls. Keeping GttSR open at all requires sophisticated procedures and specialized equipment. Crews conform to schedules published on seasonal Web sites. You should view pictures of snow-removal and repair operations to appreciate the need for them and to comfort yourself with the notion that these people are on the job. "The waiters [at an upscale restaurant in St Mary] are treated terribl[y,] and most of them eat either at the Park Cafe, Two Sisters, The Taco Shack, or Charlie's anyway, so -- take it from someone who knows -- support the smaller family-run places. The atmosphere is much more interesting, and the money is going to people who treat their employees with dignity. Plus, the food is great! 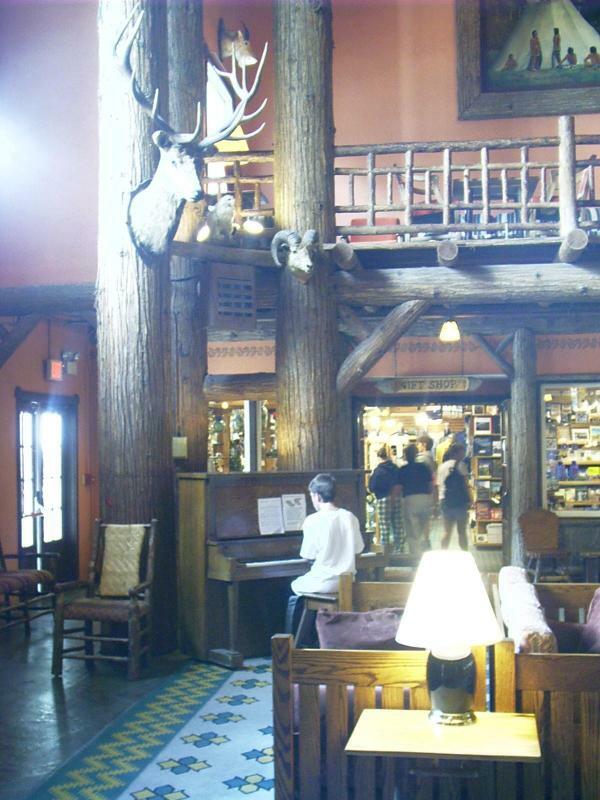 If I were you, I'd go to the Park Cafe for breakfast, The Taco Shack for lunch, Two Sisters for dinner, and the Babb Bar for after-dinner drinks. ... good places, all." Contrary to what you might suppose given this example, the English language skills of the wait staff at the Park Cafe are superior to those of their competition. Less politically progressive readers will be gratified to learn that First Lady Laura Bush eats there! St Mary Lake in the foreground is in the watershed of the Saskatchewan River. Rain falling this side of Triple Divide Peak winds up in Hudson Bay. 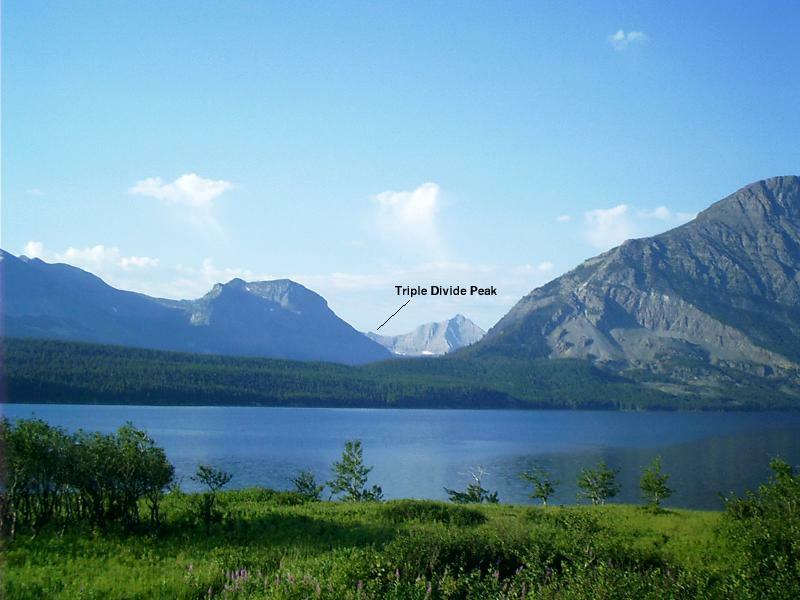 Triple Divide Peak is on the Continental Divide. Rain falling behind it to the left is captured by Cut Bank Creek and winds up in the Gulf of Mexico. Rain falling behind it to the right follows the Middle Fork of the Flathead River via Nyack Creek and winds up in the Pacific Ocean. This is the picture everyone takes. It's only a few steps from the turnout to the overlook. The legend is that a pair of geese occupied the island for a couple of years, but that was quite a while ago. Did I say everyone stops here? I meant everyone! This turnout is typically congested, but, if you take my advice and start early from the east side, you should be able to squeeze in. The sight of snowfields is commonplace, but this glimpse of Jackson Glacier is the only good view of a glacier that you can get from the road. 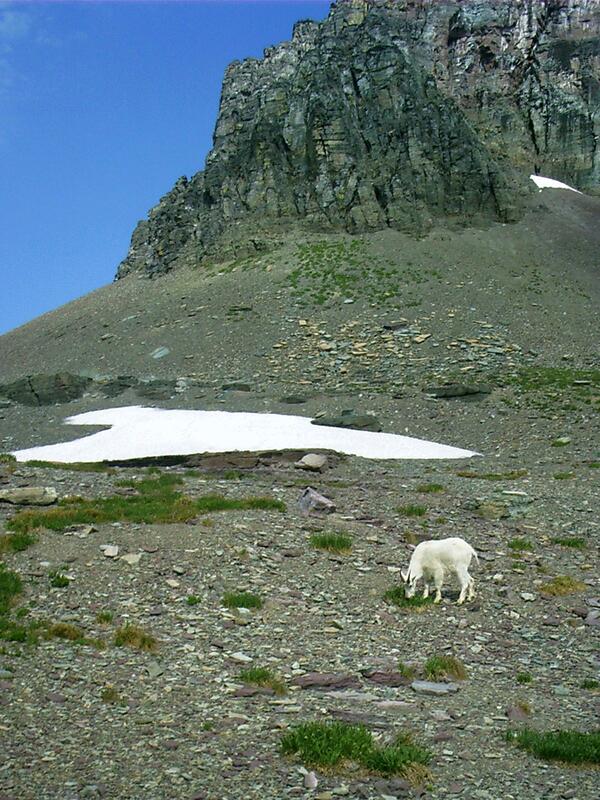 The glaciers of Glacier National Park appear to be excellent barometers of climate change. 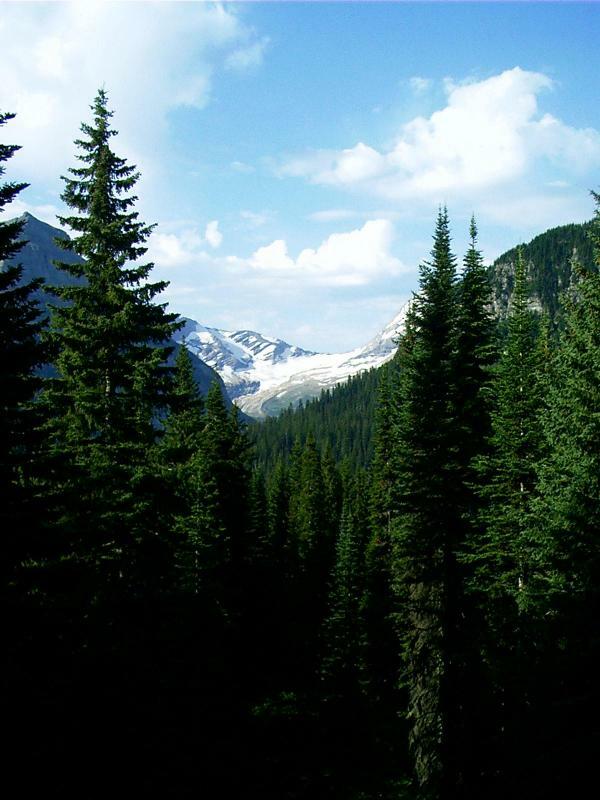 For instance, there was a drastic rate of glacial retreat during the period from 1920-1940 when this region had above average summer temperatures and below average annual precipitation. From 1960-1979, several of the larger glaciers advanced very slightly during a period of greater precipitation and lower temperatures. Thus, long-term reductions in glacier size reflect long-term increases in average temperature and/or reductions in winter snow. 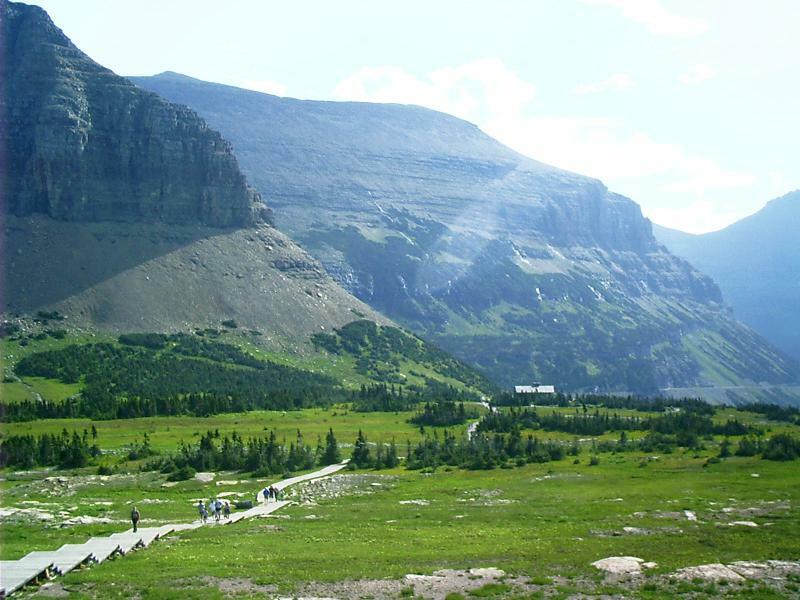 The Visitors' Center is "a monument to man in God's country," which sits on the saddle that is Logan Pass -- just to the left of center. Clements Mountain is an example of a glacial landform called a horn. I rode GttSR from St Mary to West Glacier. That way I was on the inside lane next to the north face of St Mary valley and along the Garden Wall west of Logan Pass. Opposing drivers from the flatlands were crowding and crossing the center line, trying to keep away from the low rock parapets separating them from the nothingness on their right hand. I reached the Logan Pass parking lot about 09:00 am. It was not full. There were a number of motorcycles in the lot, occupying special bike corrals, which are provided at both ends of every row of diagonally parked cars. I shinnied up the boardwalk to Hidden Lake overlook. They say this is a 1-1/2 mile trek, but they don't tell you how far up that is. As time wore on, the pedestrians passing me became numerous. By the time I returned to the parking lot about noon, the scene there was ugly. All the tourists that the lot could hold had joined a traffic melee, circling in their SUVs and slamming them into any conceivable space. From time to time there are proposals made to widen GttSR to three or four lanes. One supposes the intended result to be like I 70 through Glenwood Canyon, CO. These suggestions are taken no more seriously than those to initiate food service on Logan Pass where water must be hauled in and waste trucked out. The Garden Wall is an arete formed when two separate glaciers work on opposite sides of a divide. Besides avoiding the crowds along the boardwalk, another advantage to an early start is seeing wildlife, which regularly retires in midafternoon. 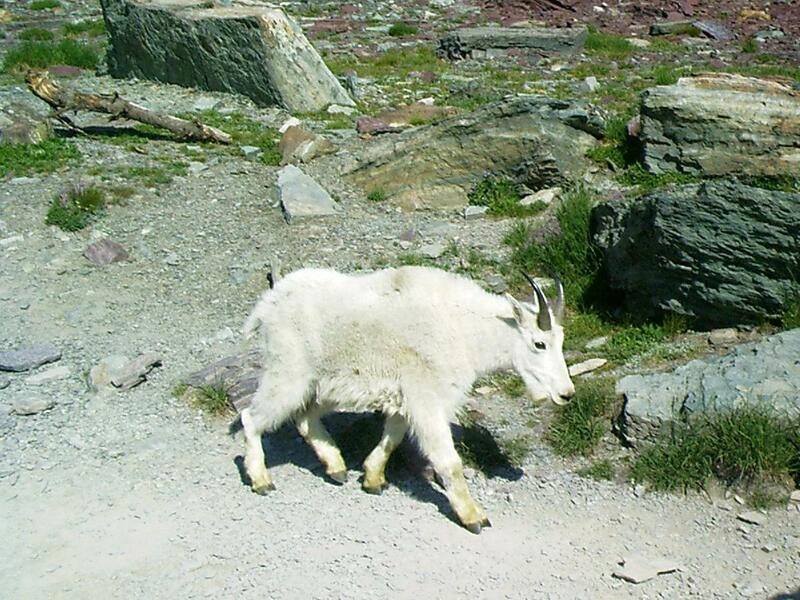 This goat leaves the hubbub to take a siesta. Tourists are strongly cautioned not to approach wildlife and, when possible, are restrained from doing it by the Park Service. Wildlife relies on this and presents a fearless aspect. Carry your camera everywhere you go. Maybe the wildlife is acting coy. Take your pictures of landscape, instead. Perhaps the sun is hidden by clouds, and the vistas are obscured by mist. That's when the wildlife may be near, and you need to keep your eyes pealed. Eventually, one reaches the Hidden Lake overlook. 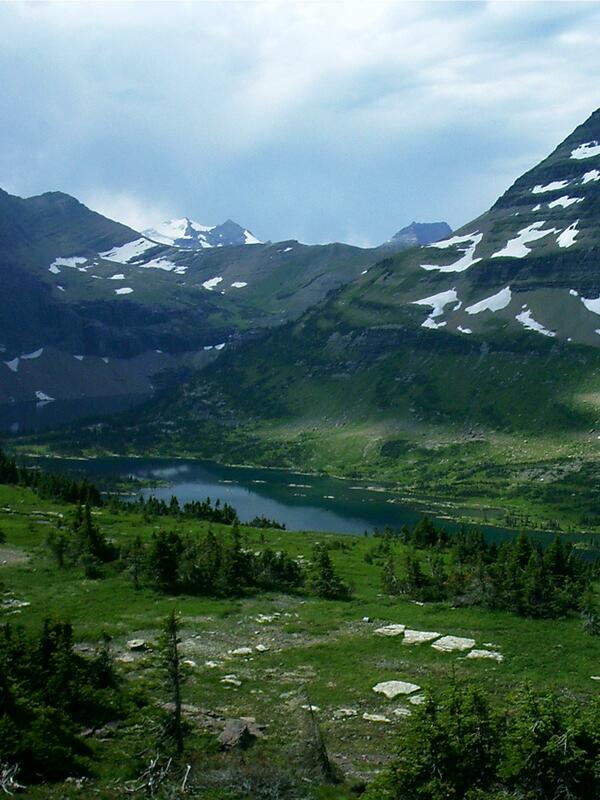 The trail to Hidden Lake crosses the Continental Divide. This is about as far from drainage as land can get. 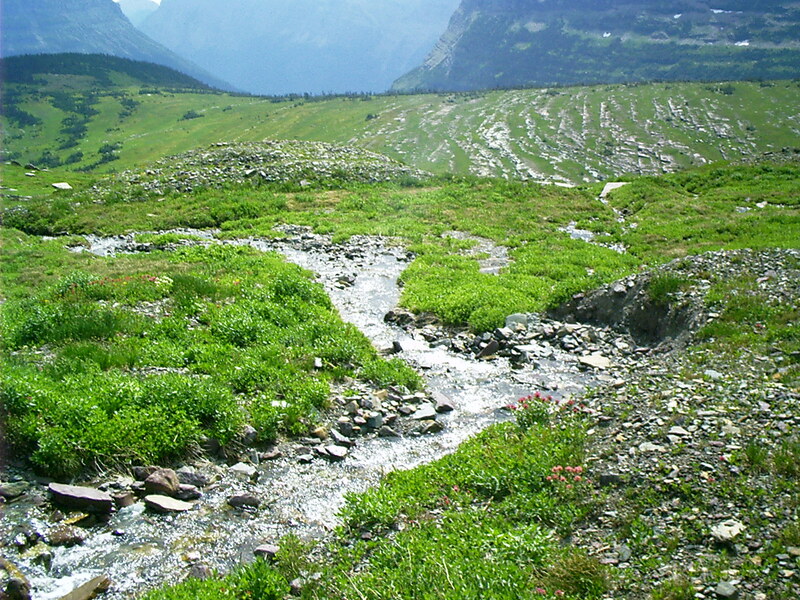 The contours of the rock layers at the upper right are grooved straight across by abrasive stone carried in the glacier that leveled this meadow. The grooves are aligned in the direction of flow. "Did you see a glacier run through here just now?" "Yep, it went thataway." These trees are growing at their altitude limit. Environmental stress impacts their shape. Descending GttSR from Logan Pass toward West Glacier, one finds the scenery no less impressive than that east of the Continental Divide. Glaciers carve U-shaped valleys. When they retreat, they often leave hanging valleys, which end in midair. There is a large turnout near a newly erected complex of stairs and platforms, which facilitates sightseeing concomitant with the unloading and reloading of buses. 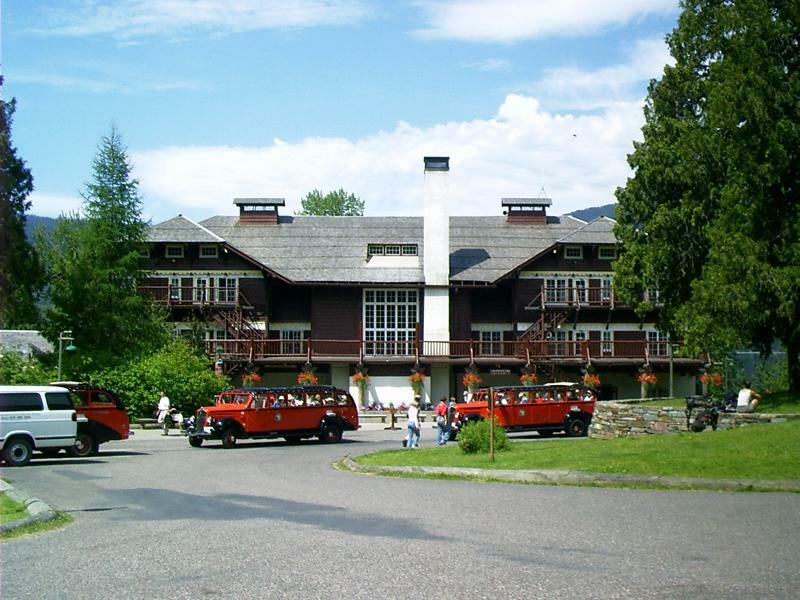 Built in 1913 by John Lewis, Lake McDonald Lodge was known as the Lewis Glacier Hotel until 1957 even though the Glacier Park Hotel Company, a division of the Great Northern Railway, had acquired the concession in 1930. This building predates roads in the area. Patrons arrived by boat. Thus, it faces the lake. This, the landward side, is the rear of the structure. Mr. Lewis' collection of hunting trophies is still displayed in the lobby. I reached Apgar at the lower end of the lake about 03:00 pm. This is the western terminus of GttSR. 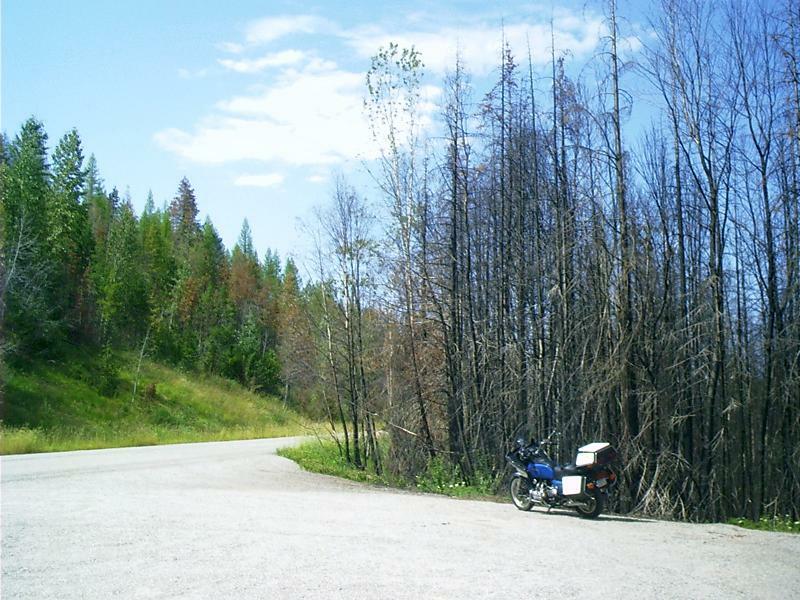 About a year ago in 2003, wildfire swept around the north side of Lake McDonald. As is usual with wildfire, it burned erratically. In this place, the road served as a firebreak. 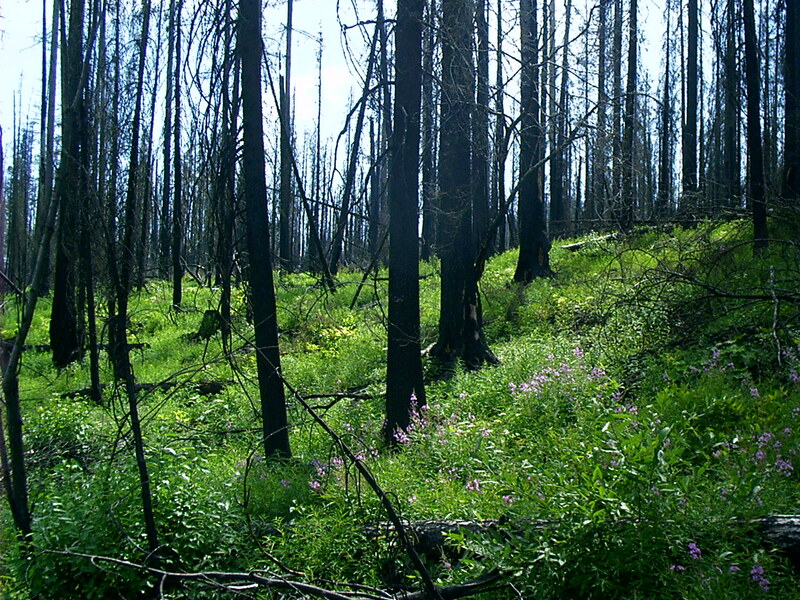 The flora and fauna of the Rockies are fire adapted and regenerate quickly after wildfire burns. Fireweed seeds are omnipresent and germinate where the soil is disturbed. Thus, fireweed is one of the first species to take advantage from fire's passing by. Rhode, Chuck. "Going to the Sun." 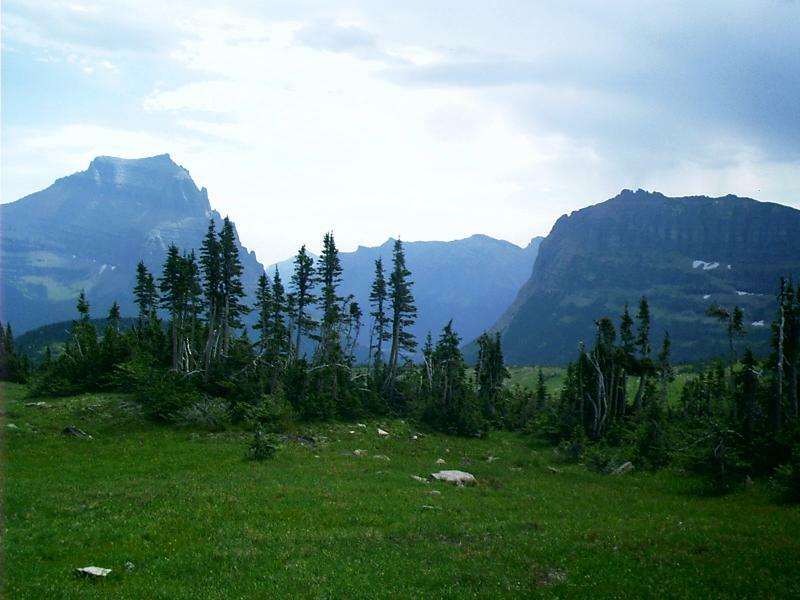 The Hi-Line and the Yellowstone Trail: To Glacier Park and Back Again. 1 Sept. 2004. Lacus Veris. 24 Apr. 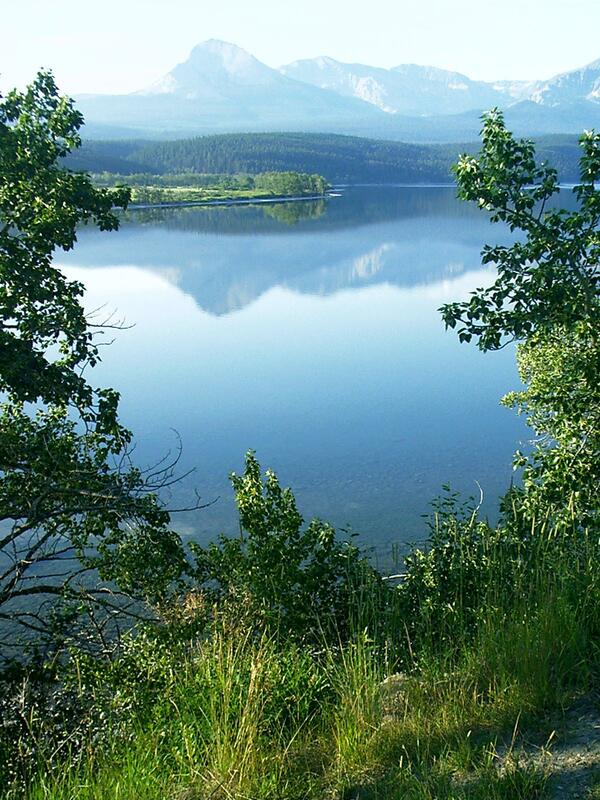 2019 <http://lacusveris.com/The Hi-Line and the Yellowstone Trail/The Rockies/Going to the Sun.shtml>. Last modified 6 Oct. 2015. Served 12194 times between 16 May. 2010 and 23 Apr. 2019. Contact mailto:CRhode@LacusVeris.com?subject=LacusVeris.